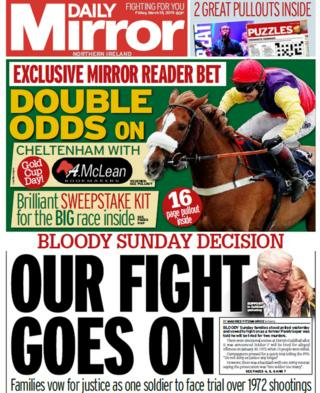 The aftermath of the announcement that a soldier will be charged for murder over Bloody Sunday is the only story that dominates Friday's front pages. 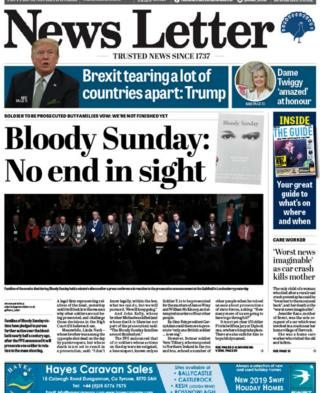 We will start with the Irish News, which reports that lawyers for the Bloody Sunday families have asked for a review of the Public Prosecution Service (PPS) decision. On Thursday, the PPS said there was enough evidence to prosecute one soldier for the murders of James Wray and William McKinney. Whilst the families of the Bloody Sunday victims welcomed this decision, they expressed their dismay that charges were not brought against 16 other soldiers who were also investigated. Responding to the decision of the PPS, the Bloody Sunday families said that if the killings had been investigated properly at the time, the outcome would have been different. The newspaper also reports that lawyers for the family of William Nash, who died during the 1972 shooting, contacted Attorney General John Larkin over comments made by UK Defence Secretary Gavin Williamson. Mr Williamson said he was "saddened" that protection against "spurious prosecutions" was not given in time for Thursday's PPS announcement. Meanwhile, the Daily Mirror details developments in the case of 77-year-old Dennis Hutchings, a former soldier who faces prosecution over a shooting during the Troubles. Mr Hutchings is charged with the fatal shooting John Pat Cunningham who was killed in County Armagh in 1974. The 27-year-old, who had learning difficulties, was shot as he ran away from an Army patrol. Mr Hutchings is due to stand trial in Belfast for attempted murder and grievous bodily harm, charges he denies. On Thursday, he appeared at the Supreme Court in London in a bid to have his trial heard by a jury. Speaking to supporters outside the court, Mr Hutchings said he was "reasonably confident" he would win his cases but that he "didn't trust the system anymore". Onto the Belfast Telegraph, which brings the news that author and Man Booker prize winner Anna Burns will return to Belfast for a public appearance. The author won the top literature prize last October for her book Milkman, which is set during the Troubles. The paper reports that she is "happy and joyous" to be returning to her home city, where she will be in conversation with fellow Irish author and Man Booker winner Anne Enright at the Lyric Theatre in April. Arts Council literature head Damian Smyth said: "We knew that Anna Burns was inventive, unnerving and daring as a writer, but it was only when Milkman appeared in 2018 that the scale of her gift was visible. "It is already clear that in Milkman, she has written possibly the best novel from or about Northern Ireland in a decade". Inside the News Letter, it reports that a woman who died in a crash on a remote rural road in County Antrim was Jennifer Kane, a care worker. The accident happened on the Moycraig Road near Dervock at about 08.00 GMT on Thursday. An ambulance crew, paramedic car and air ambulance were all sent to the scene. Ms Kane was the sole occupant of the Vauxhall Corsa and was taken to the Causeway Hospital, but later died. Her son, Brent, posted a message online on Thursday saying Jennifer's death was "the worst news imaginable".